MailChimp can help all types of businesses, but it’s best for a small entrepreneur who is looking for a way to kick their marketing and word-of-mouth up a notch. MailChimp provides an easy-to-use, intuitive program that uses tracking, data, and time-tested tools to help create targeted emails and campaigns that are effective and get noticed. It’s hard to argue with the “Forever Free” plan, which lets users send 12,000 emails per month to up to 2,000 accounts. For big-time businesses this probably won’t be enough, but it’s a risk-free way for small business owners to use one of the best email marketing services on the market. 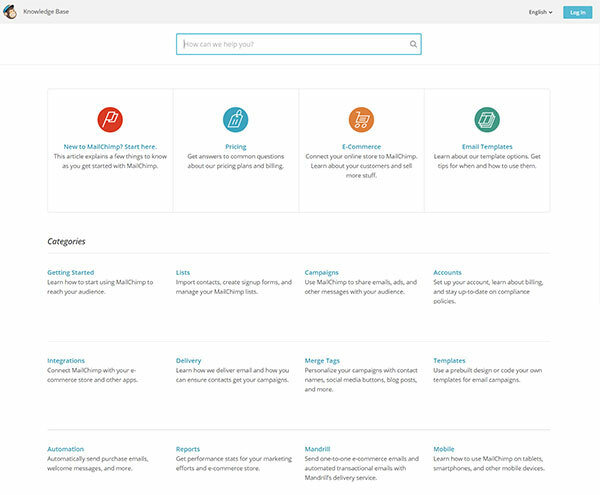 MailChimp is easy to use – it walks you step-by-step through the creation of campaigns with an interface (including drag-and-drop templates) suitable for even the most novice user. It has a variety of campaign options, including: build your brand, connect with contacts, sell more stuff, boost customer loyalty, and bring people back. All these guide you with pointers on how to make emails more personalized or clickable, and use extensive tracking to let you know who clicks on your campaigns and how you can improve your results. For Ecommerce stores it can track data on who buys what, to help you target them better down the road. Integrates well with hundreds of apps, including Ecommerce apps like Shopify, Magento and WooCommerce. Advanced segmentation allows you to target emails to different users based on a variety of criteria you decide, such as age, gender, and location. MailChimp can also send emails out to people similar to your contacts. Extensive marketing automations (auto follow-up after purchases, birthday messages, product recommendations, and much more). Facebook and Instagram ad campaigns. Campaign reports that use extensive data to see what is working – and what isn’t. Dozens of email templates (80+) to suit a wide variety of needs. Easy-to-use MailChimp App helps you manage your email marketing campaigns no matter where you are. The segmentation available on MailChimp means you can really get down to the nitty gritty and micro-manage your campaigns to maximum effect. This is a welcome shift from the sort of “carpet bomb” style mass email lists of old, and allows you to be more smart and precise with who you reach and how. The automation options are extensive. Pre-made automation workflows are broken down by industry, from Ecommerce and retail, education, to software and more. Using MailChimp should also lower the chances of losing customers or individual sales. The platform offers an abandoned cart follow-up that reaches out to customers who have added items to their shopping carts but haven’t yet pulled the trigger on the purchase. It also has a highly-searchable knowledge base and customer service that is available by email message, even for users of the free service who haven’t paid a dime. Email campaigns on MailChimp are created on a drag-and-drop template interface that’s very easy to use. There are 9 different email layouts available, which utilize 5 intent-based templates and more than 80 themes. The themes range from events and holidays to stationary and sale announcements. Users can also code their own templates to then be used with the email editor. The templates look great on MailChimp’s App and are mobile responsive – meaning you can modify them on your phone or tablet. MailChimp’s pricing plan is unique – and a bit complicated. The “Forever Free” plan is, of course, free, but you lose out on a lot of features like automation and customer service by chat. The monthly payment plan includes unlimited messages, with the pricing adjusted according to the number of subscribers, beginning at $10/month for 500 or fewer subscribers. There is also a pay as you go option, with the price per email dropping as the number of emails increases. For instance, 300 email credits runs $9, or .03 cents per email, while buying 7,500 emails will cost $150, or .02 cents per email. The pro marketer package is for enterprise-level service, and it costs $199/month. It includes a number of features such as multivariate testing, extensive automation and use of analytic reports, and subscribers are given first priority in their customer service queries. Right out the gate, when you set up a new account you’ll be asked for your name and an email and password, followed by the name of your business, website, and other basic details. You can then sign up for a series of emails to walk you through the email setup and design, as well as a helpful newsletter. Follow the prompt to “create campaign” and the system will guide you through each step. You can easily find a new audience with ads or collect subscribers with a pop-up form. MailChimp will then walk you through everything you need to know about the targeted email process. Where to put your recipients, how to use the templates, and who to send your emails to. You’ll get pointers on how to write an email or advertisement in a personable way that will get clicks, which is just the sort of insider knowledge that most people doing this for the first time simply don’t have. The platform will also walk you through all the different data tracking on your campaign, to help you see where it’s hitting the mark or missing it altogether. The templates themselves are very easy to use – it’s a familiar drag-and-drop interface that most of us have used on website builders. It’s a piece of cake. MailChimp’s free option really can’t be overstated as a central feature, simply because it’s a great way to try the product risk-free, while still being able to utilize most of the features. The overall interface and ease of use is another plus and certainly a big factor in the program’s success in recent years. The automation option is a great way to set up your emails to automatically send out on a variety of variables that will help you keep yourself on top of things, from follow-ups after purchases to birthday messages to customers. Segmentation is part of what makes the service intelligent and far more than what any individual could do on their own just sending out mass emails. There’s a science to it, and by utilizing the segmentation tools, you can definitely increase the chances your emails are going to do well. Some users have stated that the automation and segmentation options are not as extensive as on other platforms. This may not be an issue if you are a small-scale business, but if you’re going bigger—or expect to—this could be a problem down the road. 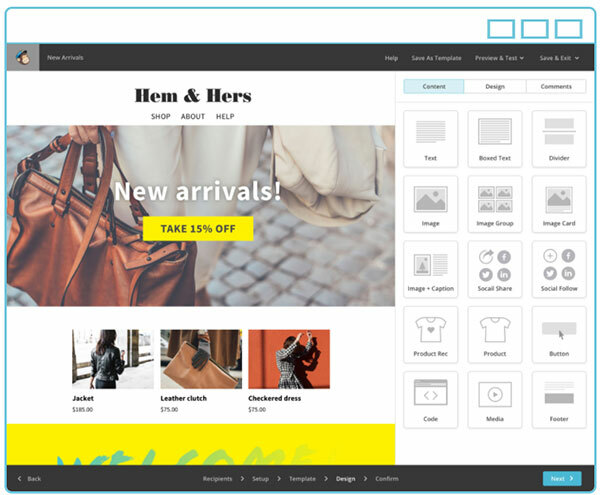 MailChimp has a number of free Ecommerce features that can help businesses increase revenues and collect data on customers. After integrating your online store with MailChimp, you can plug-in a number of Ecommerce tools such as Magento, Shopify, and WooCommerce. MailChimp will tweak your emails with product recommendations, promo codes, and customer segments. Ecommerce reports and stats are free on MailChimp, and you can also purchase ads to run on Facebook and Instagram (starting at $5/day). 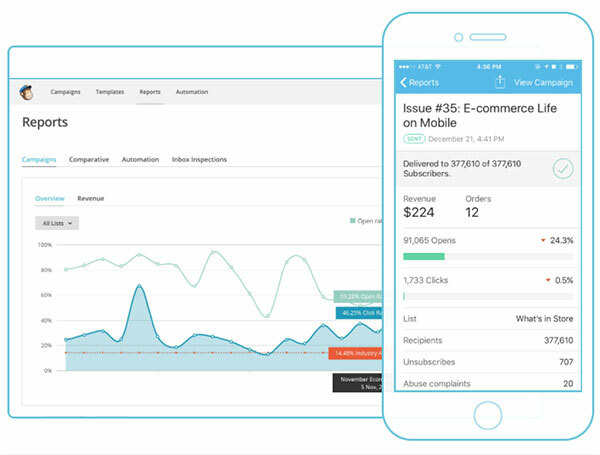 MailChimp has a mobile app available on both Android and iOS phones, meaning you can manage your email campaigns and check the data from your emails no matter where you are. Good news first: MailChimp features a very extensive and searchable knowledge base on its website, where chances are most of your questions can be answered. In addition, both paid and free users get full access to the support email form online. That said, an email sent by way of the support form was still unanswered hours later. Free users are only able to use the knowledge base and support email. If you want to use the support live chat, you’ll have to be on one of the paid plans. The support email, it should be noted, also has the option to upload screenshots, so if you can’t explain the nature of the problem you’re running into, you can just send a pic. MailChimp does not have any customer service phone line. According to MailChimp, this is to keep costs down. It also has a number of resource guides and a blog where you can get information that could help you out of a bind. MailChimp is a comprehensive email marketing platform that helps businesses of all sizes create effective, targeted email campaigns to improve their customer interaction, word of mouth, and revenue. It has a number of payment options – including free – and offers a host of features to help optimize email campaigns, inducing extensive automation, segmentation, and use of data to track – and optimize - user email campaigns. It also has a very easy to use interface and should be a breeze for any user. MailChimp was founded in 2001 and today is an industry leader, with over 16 million users including nearly 4 million new users in 2016 alone. This past year it also counted more than 246 billion emails sent by customers, according to company research. Based out of Atlanta, it is perhaps the most well-known email marketing service, largely due to high-profile ad campaigns in the US—including sponsorship of the popular podcast Serial. MailChimp is a founder-led company with over 700 employees and has earned a reputation as a growing, hot company in the tech world.